I am one very happy girl!!!! 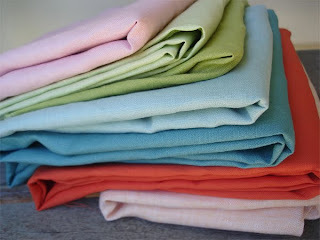 I have in my hot little hand, wait for it..... coloured linen!!!! 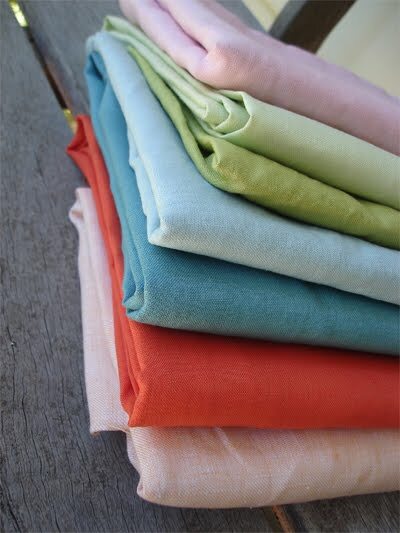 I have wanted and dreamed of using coloured linen for so long now, I have never been able to find it in Australia. Here it is, like looking at all your favourite gelati flavours all at once and not being able to choose. Well I did choose some for this visit anyway, My three favourite colours at the moment, Persimmon, Chartreuse and Aqua and a few other varieties of these and of course PINK!! Where I hear you ask, if you live in Melbourne you are in luck, The shop is called The Fabric Store it is in Brunswick Street Fitzroy, there is also a store in Surry Hills in Sydney. I will be using these in many of my up and coming designs so look out for them. Linen is the most gorgeous fabric to use and for those of you who have worked with it before know what I mean. Once again, I'm so jealous I don't live in OZ! You have the best things, and fabulous designers, like, oh . . . May Blossom! I hope you are keeping well? Could I please have your email address?